In the heart of the Rocky Mountains exists an exclusive new Keystone Colorado real estate development unrivaled in Summit County. 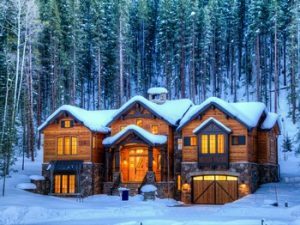 Dercum’s Dash is a destination community of 24 single family residences located on the mountain adjoining Keystone Ski Resort and bordered by the White River National Forest. Tucked away from the commotion, but still within steps to the Summit Express chair lift and gondola and only a short walk to the shops and restaurants of River Run Village, Dercum’s Dash’s location and amenities are second to none. To compliment the natural beauty of the surroundings and plethora of all season amenities, the homes at Dercum’s Dash offer the utmost in luxury, quality, beauty, and convenience. Two of these Keystone homes are now completed and move-in ready: The Mountain Modern retreat and a Mountain Rustic retreat. These incredible residences feature stunning designer finishes throughout and impeccable artisan and craftsman quality without compromise. A home foundation is also available with flexible custom floor plans to create a unique home of your own. In addition to these fabulous Keystone homes ready to be delivered, the builder/developer has released 5 Keystone lots for home reservations with floor plans that are customizable; making your Keystone mountain dream home uniquely your own. With award-winning landscaping, countless energy saving advantages, and the perfect fusion of luxury and comfort, these homes are your Summit County real estate mountain retreat dream come true. Keystone, Colorado is a renowned family destination with skiing terrain for all ages. The area offers multiple five-star restaurants, two championship golf courses, spas, and a vibrant nightlife. The year-round lifestyle and activities have mass appeal including mountain biking, hiking, fishing, horseback riding, snowshoeing, ice-skating, and so much more. If you are looking to build a custom home or purchase a brand new luxury Keystone, Colorado home, arrange a time to view Dercum’s Dash with Justin & Krystal Knott at LIV Sotheby’s International Realty.